Diane is a graduate of Kansas State University currently working as a Quality Improvement Specialist for TFI Family Services in Manhattan, Kan. She grew up in Oakley, a small town in western Kansas. In her free time Diane enjoys scrap booking and drawing. Diane is the daughter of Edgar (Ed) and Debra (Debbie) Poe who still live in Oakley. Diane has two older brother and a younger sister. While growing up Diane and her siblings were avid swimmers and actively involved the local 4-H club. Diane helped cheer on the Oakley Plainsmen in high school as the cheerleading captain her junior and senior years. After high school Diane was awarded a scholarship to cheer at Colby Community College. Diane graduate from CCC in May 2005 with an Associate of Arts degree. Then pursued a degree in Family Life and Community Service (BS) at KSU graduating in May 2008. 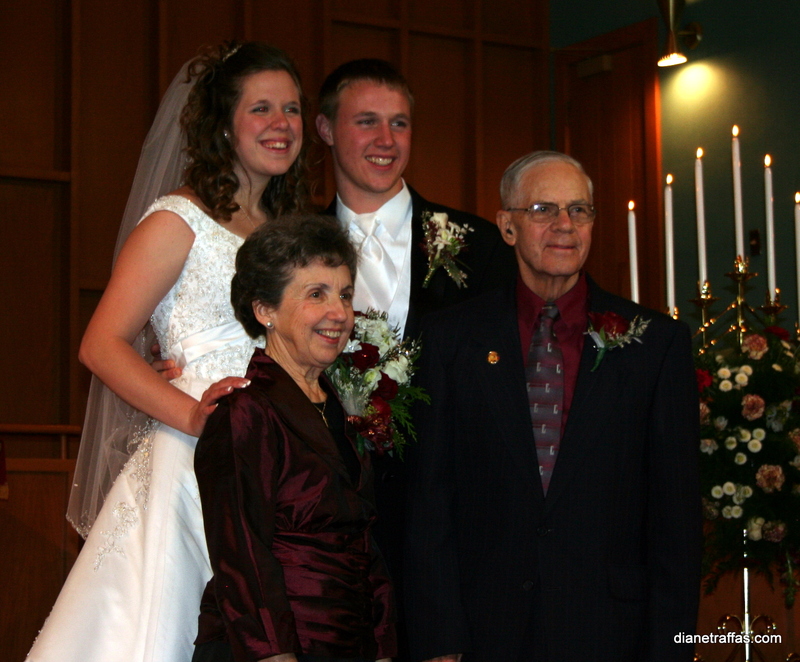 Diane and Aaron met through a mutual friend in the fall of 2006. 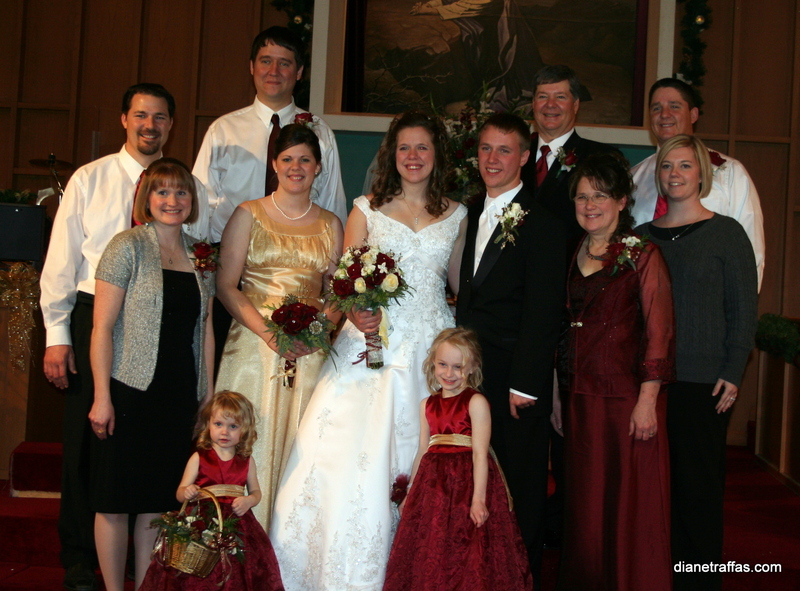 After dating for nearly 3 years Diane and Aaron got engage in October 2009. Ed is the father of Diane. Ed and his wife Debbie reside in Oakley, KS. Ed and his brother Dale own and operate Poe Well Servicing Inc. in western Kansas. In his free time Ed enjoys helping out at Wakeeney Speedway which is manager by a close friend of his. Ed also enjoys watching high school sporting events. Each summer Ed and his sons participate in the Annie Oakley golf tournament. Ed was raised in Hill City, but moved to Oberlin, Kan. in high school. Ed’s parents still live in Oberlin. Ed has four sisters and one brother most of which live in Kansas and get together for holidays. Debbie is the mother of Diane. Debbie works as a para-professional in Oakley Middle School, she also works at Everythings-A-Bloomin a local floral shop. Deb has been a floral designer for over 30 years. Deb will be designing all of the flowers for Aaron’s and Diane’s wedding. In her free time Debbie enjoys scrapbooking and spending time with her family including her two grand-daughters and her cats Rascal and Scamper. Deb like Ed has 4 sisters and one brother. Deb’s parents recently moved to Muscotah, Kan.
Craig is Diane’s oldest brother. Craig is married to Lindsay and they have two daughters, Julianna (6) and Gabriella(3). Craig will be an usher for the wedding, while Lindsay will be a bridesmaid and Julianna and Gabriella will be flower girls. Craig and Lindsay met while attending Kansas State University and were married in November 2003. Craig and Lindsay live in Manhattan, Kan where Craig is the General Manger of Covan Moving and Lindsay is an In-Home Daycare provider. David is Diane’s older brother. David is married to Christine they live in Wichita, Kan. Dave works as Grounds Manager at Heartspring Schools while Chris works for Flint Hills Resources a Koch company. Dave and Chris also met while attending Kansas State University. They were married in Wichita in January 2008. Dave will be an usher at the wedding while Chris will be a bridesmaid. Holly is Diane’s younger sister. Holly just got married in January 2010 to Luke. Holly and Luke are both attending Kansas State University. Holly is studying to be a high school math teacher while Luke is studying biology. Holly will be Diane’s matron of honor at the wedding. Holly and Diane are very close and enjoy spending time together walking and talking. Marvin and Ruby are Diane’s paternal grandparents. Marvin and Ruby live in Oberlin, Kan. They have 6 children, 24 grandchildren and 6 great-grandchildren. Diane is the oldest granddaughter. Diane has many fond memories of visiting her grandma’s house where she and her siblings and cousins would sew quilts and bake cookies. Ruby and Marvin have both worked with Poe Well Servicing Inc. Ruby also is a very talented seamstress, she will be sewing all of the bridesmaids’ and flower girls’ dresses for the wedding. Jim and Shirley are Diane’s maternal grandparents. Jim and Shirley currently live in Muscotah, Kan. near their son. 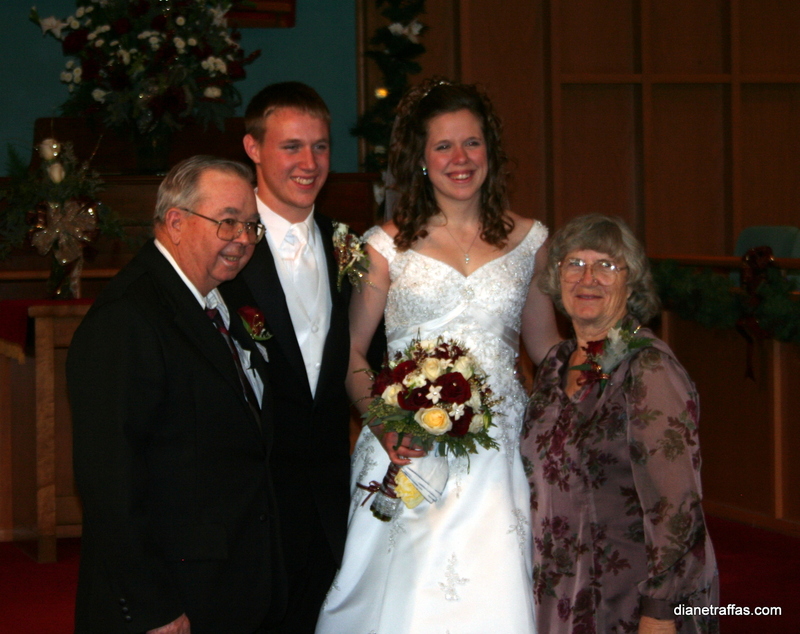 Jim and Shirley have 6 children and 19 grandchildren and 2 great-grandchildren. Jim worked as an Ag teacher and FFA advisor for many year. Jim and Shirley are actively involved in their local church and enjoy supporting their grandchildren at all school events they are able to attend.